There is something profound about being with a group of Aboriginal people, regardless of the nation – the sense of pride, mutual respect and warmth of commonality that resonates, at all ages. At the 6th Annual Eagle Spirit High Performance Camp, held at McGill May 20-21, I observed incredible athleticism, creativity and character over this weekend full of laughs. The Eagle Spirit is a much-needed outlet for Aboriginal youth in Canada, nurturing their successes, excellence and leadership capacities. The overall goal is to provide a unique and welcoming opportunity for Native youth to become acquainted with life on campus as a McGill student athlete, exposing them to a myriad of physical, social, spiritual and cultural opportunities. Another goal is to connect youth with other nations, who in most cases were joining us from isolated communities. For instance, one camper traveled two whole days to get to the camp. 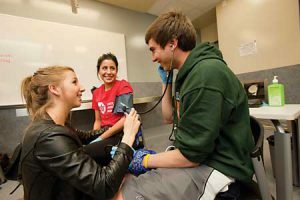 Although the primary career focus has been on health science, the variety of backgrounds from our camp leaders is key to opening the doors of possibility for many of the youth. We were extremely fortunate to have a variety of admirable camp counsellors, most of them of Aboriginal descent, who were dedicated to making this weekend a memorable experience for the kids. Regardless of skill and knowledge level, the kids were encouraged to ask questions, participate in activities and workshops and interact with counsellors coaches, and special guests. A variety of hands-on educational activities were offered, such as wilderness medicine, an anatomy lab with cadavers and medical students, a session at the medical simulation centre, a spoken word workshop to promote literacy and creative expression, goal-setting with guided meditation and a ‘finding your passion’ workshop. knowledge of medical students. One boy said to me, “Awesome! I’m going to go home and tell my mom I got to hold a real human heart.” I was impressed with their questions and their pre-existing knowledge entering the lab. With sport and physical activity being a primary focus of the Eagle Spirit camp, participation was critical among our five teams, which were appointed by the camp facilitators: the Yellow Hornets, the Green Frogs, the White Snowy Owls, the Blue Wolves and the Red Bulls. It was action-packed, exposing the youth to many novel activities such as yoga and inner tube water polo. The key values of teamwork and sportsmanship complemented their competitive spirits, especially during the rigorous two-day physical testing. At one point during the testing, we had to terminate the “timed wall sit” because it had come down to four campers, stressed and pressed against the wall with legs trembling and sweat pouring from their faces for an astonishing 10 minutes and 30 seconds! The gymnasium was shaking with the cheers from their fellow campers with an astonishing level of energy. Being Native, the social dimension came naturally for most and was further enhanced by the opening ceremony with words from our elder, Sonny, talking circles amongst phenomenal meals provided by Kwe Kwe Gourmet (catered by a local woman from Kahnawake), and the final gala dinner and awards ceremony. Many of the campers had participated in previous years and a select few were even invited to take on a leadership role as a junior counsellor. 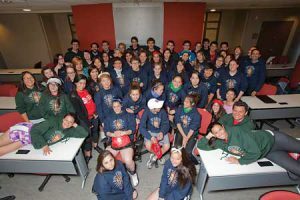 At the final gala, selecting the MVPs, honourable mentions and most congenial campers was a very difficult process for us camp facilitators and counsellors. The recipients demonstrated sportsmanship, respect for others, a strong work ethic, kindness and a positive attitude. There was a noticeably profound impact on the self-confidence of the deserved winners; their peers had voted and the smiles were abundant. 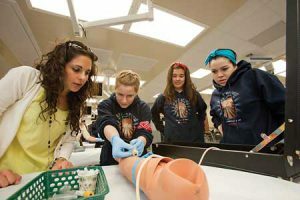 Future directions of the camps will focus on integrating more cultural sharing amongst the campers and highlighting careers outside of medicine and health science. Enhancing the recruitment to youth living in the west and integrating a family dimension is on the horizon to further enrich the camp experience and captivate individuals to pursue studies and athletics outside of their communities. These young people made me proud to be Native – they were truly an impressive group with an overwhelming amount of potential. I am honoured to be a part of the Eagle Spirit camp and I look forward to seeing the growth over the years to come. Jessica Barudin from Kwakwaka’wakw, Namgis First Nation, is a McGill Physical Therapy graduate student. She served as a counsellor at the 6th Annual Eagle Spirit High Performance Camp organized by McGill’s First Peoples’ House.